When you enter an old building, such as an ancient church or castle, you may feel as if you are surrounded by history. The building around you has survived through battering storms and rain, stayed standing through wars and conflict, and remained the same as the world around it has changed. Although the initial design of these cultural heritage sites contributes to their longstanding existence, additional protection is often needed to avoid deterioration. 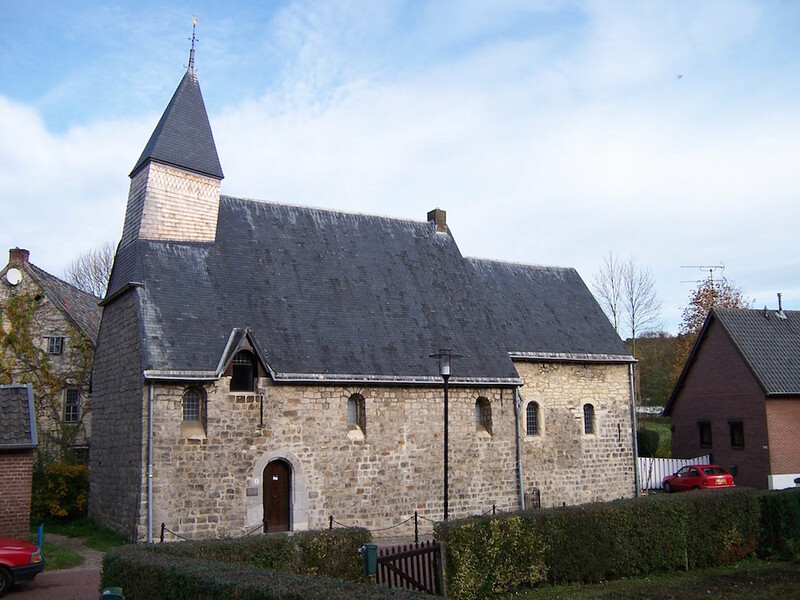 As an example, let’s take a look at a chapel in Lemiers, the Netherlands called Saint Catherine’s Chapel, which was registered as a Dutch state monument in 1967. St. Catherine’s Chapel. Image by Sigibert — Own work. Licensed under CC BY-SA 3.0, via Wikimedia Commons. St. Catherine’s Chapel was built in the 11th or 12th century, although the remains of an older building exist within its foundation, possibly from the 8th century. In its entirety, the chapel is the only complete surviving example of the Netherlands’ first type of stone church; however, this is not the chapel’s only claim to fame. It is also home to famous paintings by the artist Hans Truijen, which are displayed on the internal walls. Today, these paintings are decaying at an increasing rate, especially in areas closer to the floor, where entire sections have disappeared. But what is causing such deterioration? We can look at the natural environment surrounding the chapel to answer this question. Painting deterioration inside St. Catherine’s Chapel. Images by Henk Schellen et al. and taken from their COMSOL Conference 2015 Grenoble presentation. High groundwater levels and a nearby creek with a propensity to flood create problems for the structure. These combined factors cause the crypt underneath the chapel to flood, resulting in water traveling up the chapel walls. As the moisture rises, the salt that it carries is entrained within the walls. Then, when the salt dries, it forms crystals that have as much as 80 times the volume of the salt in a solute state. This expands the stucco and overworked paint on the walls, damaging the precious artwork. To help prevent this, a research team from the Eindhoven University of Technology used physical experiments and the simulation capabilities of COMSOL Multiphysics to better understand the damage to cultural heritage sites that is caused by rising moisture levels. They also looked into solutions to the issue, including drying strategies and drainage. During a period of two consecutive years, the researchers collected a wide range of data from St. Catherine’s Chapel. These measurements include the indoor and outdoor air temperature and relative humidity, heat flux on the external walls, CO2 concentration, solar radiation, microclimate conditions near the walls, and moisture content at different wall points, as well as indoor surface temperature and relative humidity. One such measurement, moisture content, required the researchers to measure the chapel crypt twice, once when it was flooded up to the entrance hatch and once when it was dry. From these measurements, they discovered that the high moisture levels were located in areas where painting loss is most severe: close to the floor and in the wall above the crypt. Further, their measurements indicated that high groundwater levels caused the rising moisture in the chapel. Measurements showing the averaged moisture content in the chapel walls. The blue line shows the groundwater level. Images by Henk Schellen et al. and taken from their COMSOL Conference 2015 Grenoble paper. With this, the research team had verified the dampness problem at the chapel, but not how the indoor and outdoor climate conditions relate to the deterioration of the chapel’s paintings. Their next goal was to use the collected measurements to provide data for their simulations and validate their model. To begin, the research team built a multizone hygrothermal building, or HAMBase (heat, air, and moisture), model of the chapel. The model divides the chapel into three zones: chapel (nave and choir), attic, and crypt. 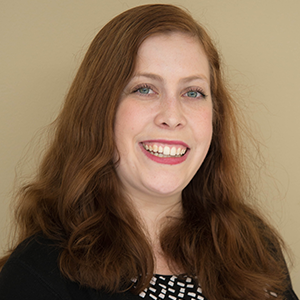 This model enabled them to calculate the indoor temperature and relative humidity that occurs as a result of building properties and changes in the outdoor climate, climate control system, and building use. In an effort to minimize simulation errors, the team also utilized inverse modeling techniques. Here, they created a thermal and hygric model for each of the three zones of the chapel. 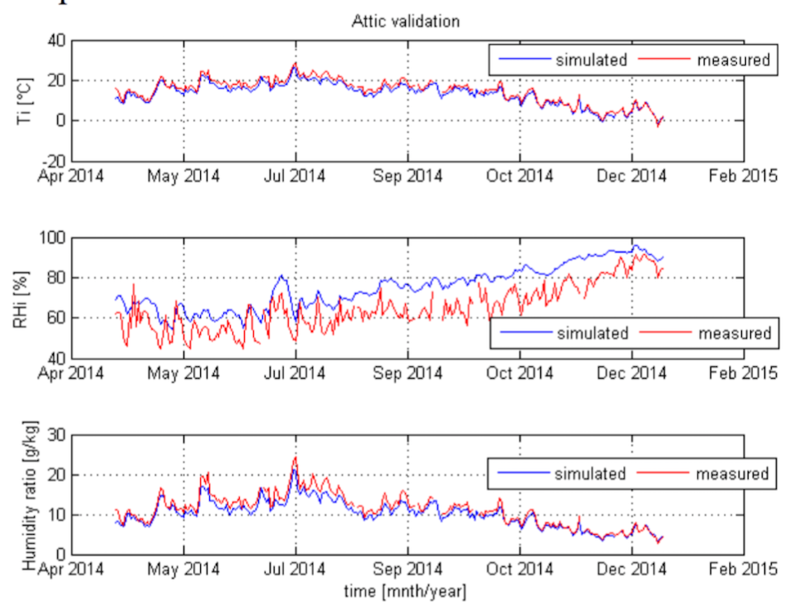 The comparison showed that the chapel and attic simulation results were similar to measured results, with the attic showing a higher temperature in the summer when compared to measured results. 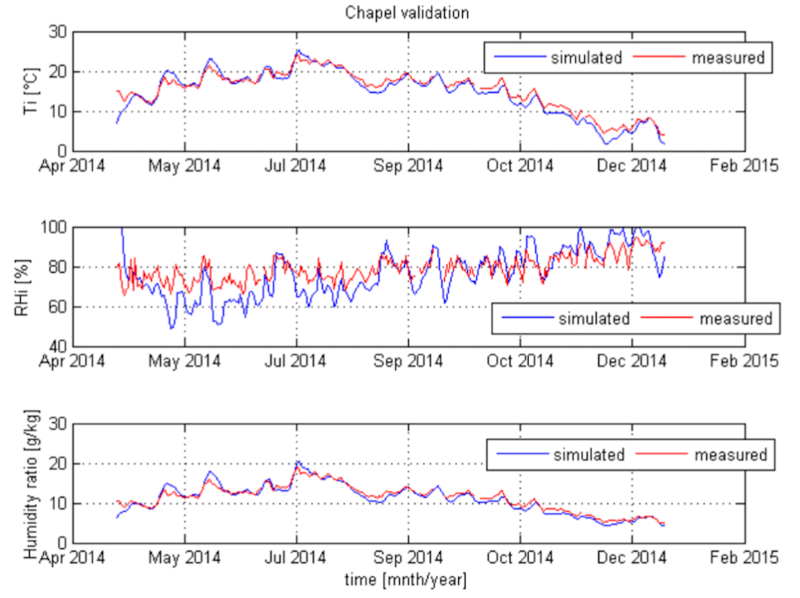 Comparing measured and simulated results for the chapel and attic. Images by Henk Schellen et al. and taken from their COMSOL Conference 2015 Grenoble paper. The crypt, on the other hand, showed the most deviation of any zone. Although the absolute humidity for the crypt compared well with measured data, there were deviations in relative humidity. With that in mind, the team used inverse modeling to take a closer look at the relative humidity and discovered that slight deviations in air temperature can result in large deviations in relative humidity. 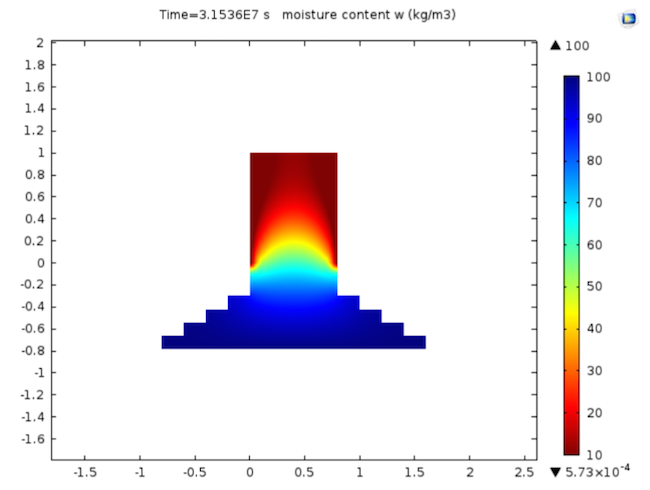 This effect, as well as the inaccurate measuring equipment and lack of additional moisture sources, may have caused the deviation between simulated and measured results. 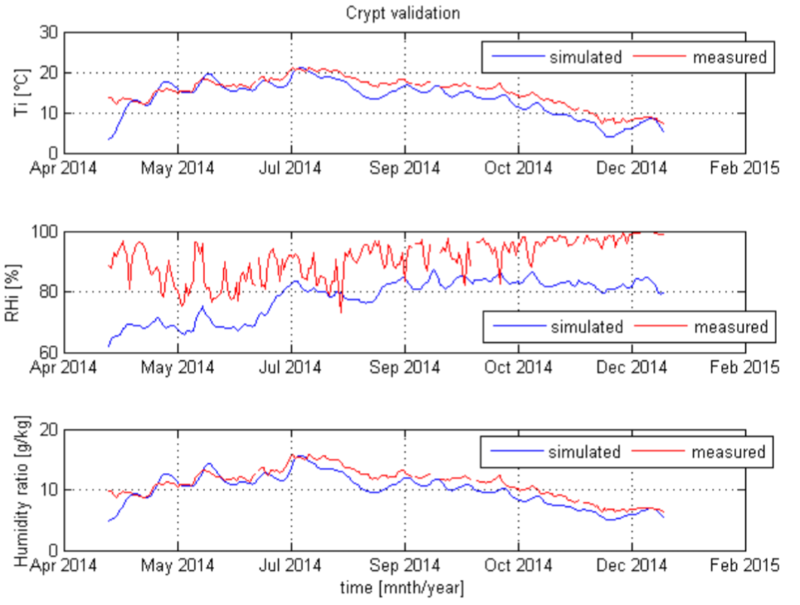 Left: Comparing measured and simulated results for the crypt. 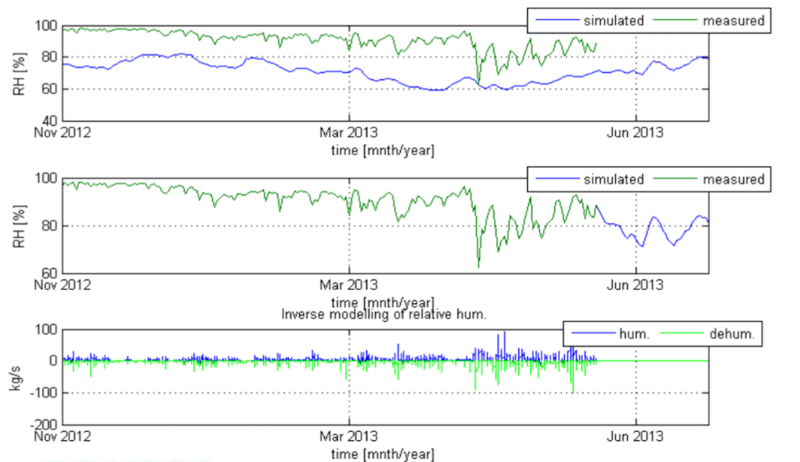 Right: Inverse modeling of the relative humidity. Images by Henk Schellen et al. and taken from their COMSOL Conference 2015 Grenoble paper and presentation. While the results thus far were useful, the indoor climate condition models didn’t enable the researchers to verify why the chapel walls were damaged. So, they decided to model the moisture transport in the chapel walls using a user-defined moisture transport equation. Their goal here was to create a model that accurately described the wetting and drying of a porous medium — in this case, the chapel walls. Top: Schematic illustrating water uptake. Bottom: Moisture content in the wall after one year. Images by Henk Schellen et al. and taken from their COMSOL Conference 2015 Grenoble paper submission. 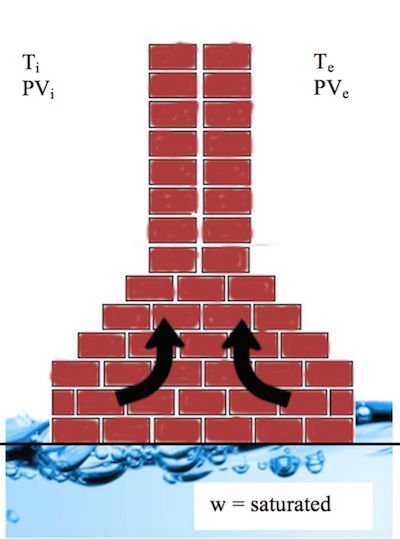 Although the exact material properties of the chapel are unknown, the simulation results successfully illustrated the effect of water uptake on the wall. By looking at the transportation of salts and evaporation of water, the researchers were able to confirm that rising water is the primary cause of the deteriorating wall paintings at St. Catherine’s Chapel. Understanding the cause of deterioration at St. Catherine’s Chapel is the first step toward finding a way to protect this cultural heritage site. Now, we can look at methods for preventing rising moisture before the damage is beyond repair. Even though solutions can be costly and rigorous, the research team did find one potential method for protecting the art at the chapel: By injecting the foundation with a water-repellent chemical fluid, it is possible to prevent moisture from rising up the walls. With this approach, the paintings can be preserved for future generations. Hopefully, the results from this research can be used to protect other cultural heritage sites in the future.